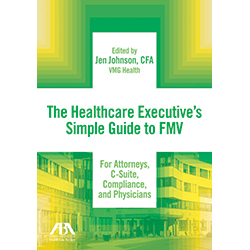 The American Bar Association Health Law Section and VMG Health present “The Healthcare Executive’s Simple Guide to FMV.” This book will assist professionals on how to navigate a Fair Market Value (“FMV”) opinion. The increased regulatory scrutiny has brought the soundness of FMV opinions to the forefront of many recent settlements. Due to the number of different arrangements and types of transactions, understanding if a valuation is defensible has become increasingly difficult. VMG Health provides complimentary comprehensive training and educational programs to healthcare organizations. Please contact Doug.Hillrichs@vmghealth.com for more information about our VMG Academy.